So, normally, this blog is aimed at the small business owner looking for marketing advice and enough design skill to make good choices when engaging a design professional. This post is not for you. This is for my brothers and sisters in the creative field. If you’ve hung your own shingle or part of a small firm, you know how limited resources are for the latest and greatest gadgets, programs and literature. I was recently at my local Borders picking over the carcass, and damn! Design book are EXPENSIVE. Not that the authors don’t deserve it, they do. But sometimes, I can’t drop $200 on books every time something changes in digital design. Enter AppSumo. 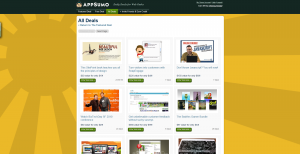 AppSumo is a Groupon for digital designers. Once you sign up, they send you emails (about 2x/week) about all sorts of deals that they have going on. Books, training, software, you name it. And it’s usually up to half off. One reason I like it is that they provide most of their deals on digitally delivered products. Seems to me that the producer of the content, since it is digital, is not taking the bath that the restaurant owner or bike shop proprietor would be for hard goods. I just bought a book from SitePoint (LOVE those guys) explaining the principles of good web design that I intend to share with my class. The price of the book at Borders was $39.99. I got a digital copy for $19. A searchable digital copy that I can have forever and it takes up no room in my tiny office. Anyway, this is a good use of the Groupon model, it seems like no one is getting hurt in the deal. So check them out and let me know what you think of the site and the deals contained within.